"Trapped in time. Surrounded by evil. Low on gas." My son Connor loves the movie Army of Darkness, the 3rd movie in the Evil Dead franchise. So to turn him into Ash, we first needed a base layer of clothing that consisted of a blue shirt, brown jeans and boots. The leather belt I made. After the character was decided my son started growing his hair so the slicked back look could be achieved. We used hair product and spray in color to blacken it. Moulage for the face with some wax and face paint and vampire blood to make cuts and scrapes. After a little use, the shirt was torn and a little blood splatter and mild weathering was added. 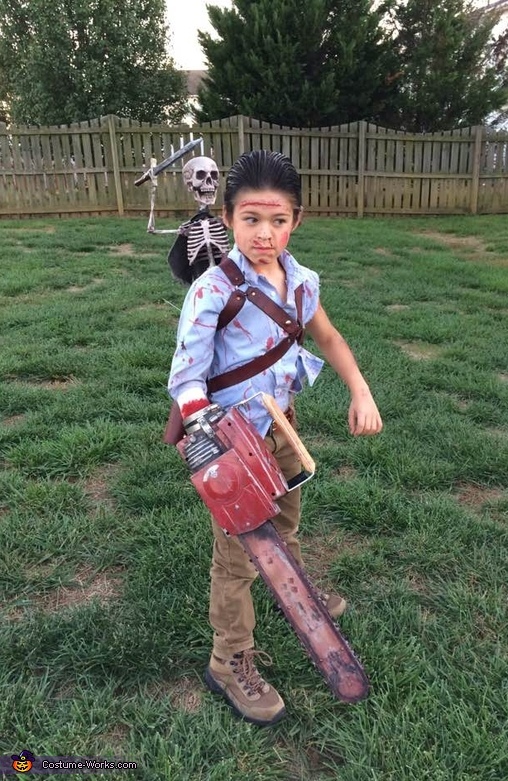 The centerpiece for the costume is the chainsaw. I picked up a costume chainsaw and modified it so the hand could go inside. I moved the rear handle to the interior, the top handle to the side and made a top handle that also anchored the interior handle. A piece of plastic tube was secured to the back and the brackets were custom fit for the prop. The prop was painted and distressed. The saw remained fully functional with sound and the blade still moves. Ash's shotgun harness is real leather. I made the pattern and did all of the sewing and construction. The shotgun is a nerf style that was painted and still shoots nerf darts. For an added effect, I picked up a 30inch skeleton, added a cape and my son assisted me with constructing a sword of EVA foam. The skeleton is attached to the shotgun harness with zip ties.